Own A Luxury Lifestyle Inspired by Shapoorji Pallonji Book Now !! Shapoorji Pallonji Astron: Welcome to a new level of luxury and comfort that touches the sky! Mumbai is a beautiful city that is sprawling with career opportunities, top-notch education hubs, MNCs, commercial zones, entertainment zones, beautiful beaches, incredible nightlife, celebrities and a life of peace and serenity. There is so much this city other than what meets the eye! Known as the ‘City That Never Sleeps’, Mumbai is the most loved city in the country that many want to be a part of today. The real estate market in Mumbai is booming with a number of residential projects throughout the city. However, living in a residential development that is a popular landmark known to all is an opportunity only a few get to experience. Shapoorji Pallonji Astron is a marvellous high-rise residential project and a part of a grand 52 acre township development in Mumbai by Shapoorji Pallonji Group that offers a comprehensive lifestyle that will be loved and appreciated for generations to come. Extended over acres of luscious land, this development contains one of the tallest high-rise towers (G +45) in Mumbai that offer 2BHK as well as 3BHK luxury apartments of different configurations to meet every requirement and taste. The apartment carpet area sizes start at 631 sq. ft. and go up to a beautiful 1005 sq. ft., offering luxury space to meet all your necessities and needs. Owning a luxury apartment at this development is definitely high-class personified! Shapoorji Pallonji Astron Mumbai is an outstanding residential development that packs a good punch of luxury, comfort and class in every corner. The apartments a spacious, provide beautiful natural lighting, cross ventilation and contain modern-day fittings & fixtures, superior flooring in every room, decorative doors, wide balconies and windows providing incredible landscape views of Mumbai City, fancy kitchens with high-quality counters and multiple provisions, electrical ports and high-quality switches located perfectly for convenient access, hi-tech safety features and the list never ends. This development also offers a magnificent range of world-class external amenities that will blow your mind! The external amenities a 1 acre clubhouse for recreation, meditation centre, multiple sports facilities and a play-zone for kids, well-equipped gymnasium, swimming pool, wide open space that will always make you feel free, fancy landscape garden, beautiful sit-outs to spend time with your family and friends, swift elevators, power back-up for emergencies and well-trained security. If high-end luxury and A-class is what you are looking out for, this development is your ideal destination. 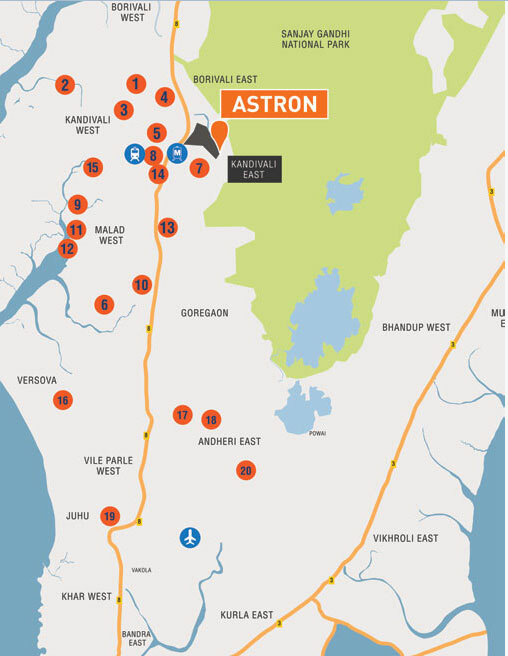 Located at Kandivali, a popular suburb in Western Mumbai, Shapoorji Pallonji Astron Kandivali has a number of your daily and emergency landmarks in close proximity. This development offers a life of convenience that will truly surprise you! Places like schools, colleges, banks, ATMs, hospitals, medical centres, malls, supermarkets, convenience stores, shopping centres, entertainment zones, cinemas, restaurants, clubs, pubs, cafes, all kind of public transport and a lot more can be conveniently accessed without worrying about traveling for hours. Starting at a price of Rs.1.70 Cr. and moving up to Rs. 2.47 Cr. the Shapoorji Pallonji Astron price is super-affordable and total worth every feature that it has to offer. A premium development with residential spaces at such a low price in Mumbai City is just like a dream come true! You can choose from a number of payment plans along with superb home loan facilities through associated banks, NRI services, customer support and more for a stress-free purchase. Welcome to a world of luxury and comfort that is high on features and modern-day living, but light on your wallet! Shapoorji Pallonji Mumbai Dreams is one of the latest residential projects in Mumbai by shapoorji pallonji group that offers premium luxury and comfort for an enriched lifestyle! Intelligent and addressable security system. Renowned Malls, Schools and Colleges, Multi-specialty hospitals within 5-7 km. radius.